Matt and John are best friends and have decided to leave Queens and head to the beach for the summer--to work. Pushing ice cream carts in humid, hot, salty air might not seem luxurious, but it keeps the boys tan and their eyes out for girls. Not a bad a gig after all. Matt and John are almost complete opposites--Matt has his sights set on Yale while John doesn't really have any plans for his future, at least not the Ivy League kind. But they have one thing in common: tragedy. John lost his father in a drive-by shooting when the boys were on their way home from a baseball game. This tragedy made the boys even closer than they were before, solidifying their friendship forever. But there's always a girl that comes along to test any friendship. While working, Matt spots Driana: tan, beautiful Driana, and his inescapable draw to her seals their fate. Driana is with her cousin Stef and Stef's boyfriend JoJo (from Rio). Stef has also felt the sting of tragedy as her mother was killed in front of her. Also a lover of windsurfing, Stef decides to go out on her own during a party, causing Driana, JoJo, Matt, and John to go after her. Immediately they are threatened as Stef is seriously injured, and they quickly become lost at sea. Only knowing each other for a day, these strangers must bond together to survive, but being strangers makes it difficult as there is an inherent lack of trust. Griffin's craft comes in writing characters who feel real, whose situation feels genuine, and whose individual outcomes define their personalities and will to survive. While at times the dialogue does feel a little forced as characters appear to know more about each other than they should for such a short time, the overall plot is extremely well-done. Sometimes the characters trust each other a little too much, but at least that shows the good side of humanity. 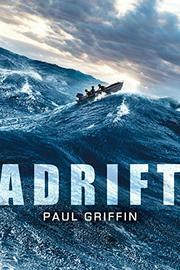 Fast-paced and thrilling, Adrift reminds me a lot of Life of Pi. The only thing I wanted more of the book were those times when people break and not everything is perfect, perhaps even some sharks earlier in the book. While I appreciate this scenario for a younger audience, a cuss word or two wouldn't have hurt. Equally unnerving at times and poetically sound in others, Paul Griffin definitely has a hit here.